Blondes have more fun, but brunettes make better music... when it comes to sultry minor-key pop, at least. 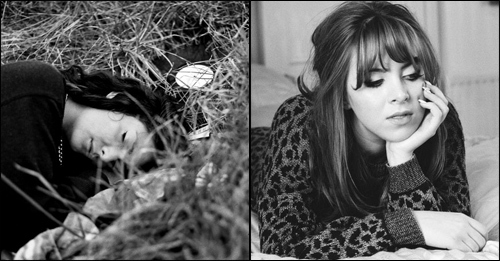 New Zealander Lorde (above left, asleep in a field) has been challenging Katy Perry and Robin Thicke for supremacy in the US charts. Her single Royals, a bone dry outsiders' anthem, is sitting at number three - a rare feat for a non-American artist, never mind a teenager. You'd think her fellow countrymen would be proud - but Kiwi critic Simon Sweetman posted an extraordinary (but entertaining) rant about the singer earlier this week. "This is a scam," he wrote. "She made this music in her bedroom at home – alone, went the original lie. The real truth is her parents were married at Universal Music’s headquarters located in the burning fires of hell somewhere and all the expenses were paid for them, Neil Finn played at the ceremony at half his usual fee. All they had to do was give up their daughter. And they did." Whoa! Hold your horses, there, Simon. Admittedly, it took a while for people to reveal that Lorde spent three years under an artist development contract at a major label. But the information was out there for anyone willing to look hard enough. And all you really had to do was scan the writing credits to discover she wasn't some genius pop maverick crafting songs out of gossamer strands she'd plucked from the air in her teenage bedroom. So was it all a scam, or just shoddy journalism? And no matter what you think of the music industry machinations or the tedious "story behind the hype", you have to admit Lorde's vocals and production are strikingly unique. The songs are catchy, too. What more do you need? Authenticity? Because I don't have enough yawns to endure that argument all over again. Lorde's response to this mauling, by the way, was smart, classy and to the point. "Let em talk," she wrote on Twitter. That's a proper pop star reaction, and no mistake. Royals isn't out in the UK til October, but Lorde posted the follow-up to YouTube last night. Team is a spiritual sequel, celebrating the people and postcodes ignored by the mainstream. "We live in cities, you never see on the screen," broods the singer. "Not very pretty but we sure know how to run things." On the other end of the controversy scale is Clare Maguire. A former BBC Sound Of nominee, she was tipped for great things but her histrionic power ballads never really connected with... well, anyone. I've already written about her reinvention as a breathy balladeer. Earlier this year, she posted a clutch of gorgeous, mellow new songs - barely demos, really - that would break your heart sooner than look at you. In her latest, Maguire is more ballbuster than heartbreaker, giving a furious kiss-off to a cheating boyfriend. From the "screw you" delivery, you get the impression he's going to take the break-up a lot worse than she is. Little White Lies ups the tempo from her earlier material, with the staccato 80s production conjuring up both Pat Benatar and INXS. It'll get under your skin in the best possible way.